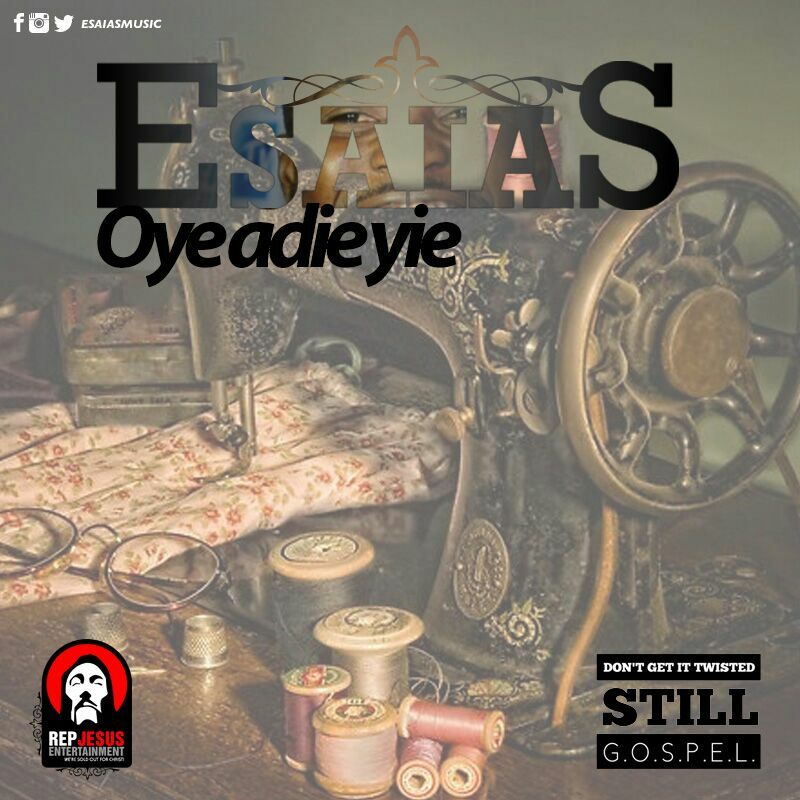 ESAIAS SET TO RELEASE "OYE ADIE YIE"
Home News Local News ESAIAS SET TO RELEASE "OYE ADIE YIE"
Esaias is gradually becoming a house hold name for his real life, deep lyrics, heart warming and lucid style of delivery in his music. Not to talk of his admirably strong stage presence. The Urban gospel show on Dominion TV host merges spirituality with music and uses hip pop as genre in his quest to reach out to his audience with the good news of Jesus Christ. Esaias introduced him self to the world with the release of his debute album in 2012. The 11 timeless track album,”ABODE FOFRO” which had hit songs like “Superman” and “Abode foforo” thriled music lovers all over the world. Recently, Esaias released 2 cloy singles titled ASEDA ft Jay shady and Nuttin (a twi rendition of Nuthin by Lecrae). Touching on “OYE ADIE YIE”,Esaias Explains “Oye adie yie is an Akan (twi) word that means one who fixes something.It is mostly used among the Ashanti communities to refere to a seamstress /tailor that sowe on mobility. They are mainly specialized in alterations. The “oye adie yie” can walk from town to town in search for clothes (attimes badly torn) to patch. The irony is, almost every Oye adie yie I have seen is old,experienced and patient. Unlike the designer brand taylor,the Oye adie yie will not hesitate to alterate any dress regardless of how big or small the holes might be. The song was inspired by my personal struggles in life and i believe in saying what you know than what you have no or very little idea of. In the year 2003, i was house arrested by an undignosable odour for two years and personally over heard a group of some women in my neighborhood discuss the fact that i am no good so therefore deserves to die. But on the contrary God heard my cry and not only healed but has honored me so much. I truly am the stone that builders rejected but has become the chief corner stone(Psalm 118:22) as sang in the song. It is the mark of every great artiste to take risks and #OYEADIEYIE is a song that is out of Esaias’ comfort of hippop to an afro-highlife zone. The unassuming silky vocal touch of Esaias on the catchy #Oyeadieyie chorus will astound those who are obviously used to him as a rapper only but can’t resist the song’s ability to pull them into an unstoppable dance mood. Feedbacks on #OYEADIEYIE have all been tremendously encouraging including that of the multiple award winning music producer and singer Moris De-voice who said “beautiful song. nice rap. lyrically potent”. The lead and rock guitar interlude in the song played by Umar (member of the award winning Nigerian rock band Thread Stone) sets the song on a pedestal of of its own class. The base line played live by Chizom (basist of the fastest growing urban gospel band-Urban harp which also happens to be Kingzkid’s band) also gave the song a remarkably echoing base chords. The catchy nature of the chorus makes it easy for all age groups to appreciate and sing along happily. Not to talk of the matured rap delivery which is unlike anything heard before. Esaias in one of his recent postings on instagram where he announced the song’s title, shared a picture of himself in the studio with Perez Music whom he stated is producer of the song. According to Es,#OYEADIEYIE is scheduled to be released online on Tuesday 15th September,2015 for free downloads. Follow @EsaiasMusic on facebook,instagram and twitter for all updates and info on bookings.